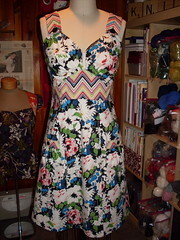 I finished this dress over the weekend! Sewing the buttons on took longer than expected since there were six. I followed the pattern as it was written and made no modifications. I did have to resew one of the straps because the chevron stripes on one strap were going in the opposite direction of the other. Luckily I caught that before I was too far along. The fit has enough ease that I could wear a t-shirt underneath if I wanted, which is perfect since the sun seems to have disappeared and layering looks to be necessary! This is so pretty. I love your choice of fabrics. Have fun wearing it. I found your blog through searching google images for parfait dresses. The first page I clicked on was your fabric choice/pattern post and I thought "Oh Dog, how could that possibly turn out wearable?" So of course I had to click through your charming blog, and I have to say your finished parfait is just stunning. I love it. Well, well done.